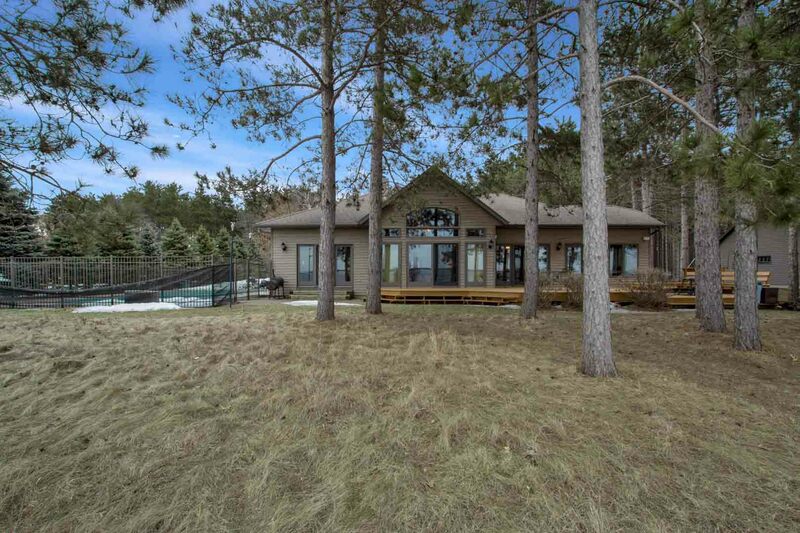 Lake Petenwell Waterfront Home! From inside or out, the view alone is worth the price. Actually, it's priceless! Looking over so much water, the view is almost like being on a boat ... a big, beautiful, 3 bedroom, 3 bath yacht with a pool kind of boat! And the sunsets! This incredible home faces dead west, so the awesome nuclear-powered Petenwell sunsets are built in. From stem to stern, starboard to port, this ship is loaded with quality, convenience and comfort. Features include a spacious great room design with walls of lake facing windows, cathedral ceiling, stone fireplace with a pellet stove insert, wet bar, and wood flooring that extends throughout the kitchen and dining area; gorgeous custom kitchen with breakfast bar, oversized upper cabinets, 4-chair breakfast bar, and new downdraft range and micro; rustic lakeside sun room with knotty pine ceiling and walls(very nice! ); amazing master suite with - you guessed it - another dynamite view, tray ceiling, spacious bath with whirlpool tub and separate shower, and the mother of all walk-in closets; partially finished lower level with a big, bright family room, full bath, and exercise room; main-level laundry; huge lakeside deck & patio; top-quality, low maintenance aluminum siding; irrigated yard with towering pines; Association pier. Now for the good stuff ... an 18x30 heated in-ground pool with wrought iron fencing, a 3-car attached garage, and a 28x38 detached garage that are both finished and heated! All furnishings and kitchenware are included! On Lake Petenwell ... a 23,000-acre boat ride, world-class fishing, bald eagles, ospreys, waterfowl, and sunsets! The long winding driveway is your gateway to paradise! Wood Ceiling: Knotty Pine Ceiling & Walls in Sun Room. Garage: 3-Car Heated Attached. 28x38 Heated Detached! Porch: Sun Room w/ Awesome Lake View!! Location: Panoramic Water View & Nuclear Sunsets! Overlooking Miles & Miles of Water! Great Walleye & Muskie Fishing!